Bring your updates or a new house to this .85 acre unrestricted Waterfront property in sought after Mill Creek Acres subdivision. Don't miss your opportunity - Call today! More photos coming soon. New construction! 3br 2ba lake get-a-way in the heart of Rayburn Country on Lake Sam Rayburn. In less than one minute you can be at the boat ramp, golf course or taking a dip in big Ol' Lake Sam Rayburn. Forest Hills Building Site - Two Lots! With all of the wonderful amenities that Rayburn Country has to offer and less than 2 miles from lake Sam Rayburn, this new home offers 2br 1ba with covered front and back porches. Look no further for your getaway home at the lake. Welcome to beautiful Tiger Creek Estates. This future home site includes just over one acre, located in a private cul-de-sac just across the street from the number #1 Lake Sam Rayburn. Water view and water access lot, UNRESTRICTED with community water and electric. 1.3 acres each with plenty room to share or subdivide. Water access lot, UNRESTRICTED with community water and electric. 1.275 acres each with plenty room to share or subdivide. Water access lot, UNRESTRICTED with community water and electric. 1.091 acres each with plenty room to share or subdivide. Water access lot, UNRESTRICTED with community water and electric. .92 acres each with plenty room to share or subdivide. Water access lot, UNRESTRICTED with community water and electric. .79 acres each with plenty room to share or subdivide. Water access lot, UNRESTRICTED with community water and electric. .81 acres each with plenty room to share or subdivide. Water access lot, UNRESTRICTED with community water and electric. .82 acres each with plenty room to share or subdivide. Waterfront acreage on Lake Sam Rayburn!! Approximately 2.44 acres of amazing waterfront property. Private location located in cul-de-sac facing San Augustine Park. 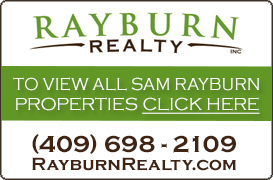 Build your dream waterfront home on Lake Sam Rayburn! Get in on the ground floor of the commercial activity exploding on Lake Sam Rayburn (Rayburn Country Resort Area). This is your opportunity to be a part of the new Rayburn Inn property. Hwy Frontage! Get in on the ground floor of the commercial activity exploding on Lake Sam Rayburn (Rayburn Country Resort Area). This is your opportunity to be a part of the new Rayburn Inn property. Hwy Frontage available! Here is something you don't find everyday. 2.935 acres on the south end of Lake Sam Rayburn that borders the Angelina National Forest and Lake Sam Rayburn right in the heart of God's Country.